May 31 - Allen had another bad shooting night with 5 of 27. But Eric Snow, playing with a fractured ankle, hit the game winner as Philly beat Milwaukee 89-88. Sixers will try to close it up on Friday. May 28 - He's back: healthier, speedier and bloodier. Iverson scored 28 points (10 for 32) as Sixers beat the Milwaukee Bucks 89-83 . In the fourth quarter, Iverson got elbowed hard in the face by Ray Allen and went down hard. "It loosened his right front tooth. It bled quite a bit initially,'' 76ers trainer Lenny Currier said. 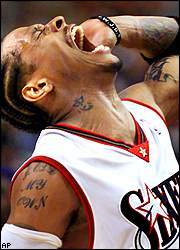 Iverson said, "I didn't think the refs were going to let me back in the game because I was spitting up so much blood. I was trying to stop the bleeding but it wouldn't stop, so I kept my mouth closed and swallowed the blood when it filled up.'' UNBELIEVABLE. No one deserves to win more than the Allen Iverson and the Sixers. May 22 - Iverson was ice-cold in the 1st quarter shooting 0-9, but he soon picked up pace and scored 34 from 13-26. Luckily, Mutombo and McKie played well as the Sixers beat the Bucks 93-85. Iverson got drilled by Cassel with an elbow in the final minute of play. He said he was dizzy afterwards. Sixers finally win their first game one of the playoffs so far. Larry Brown will be coach of the year. Like I said before, the Sixers will become the first NBA team to win 4 awards. May 20 - One of the most exciting playoff series came to an end today. 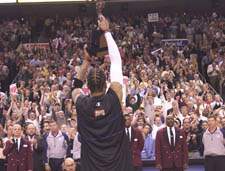 It was the final show between Vinsanity and The Answer. Who would prevail this epic battle? Their Teammates. Iverson dished a career-high 16 dimes as the Sixers beat the Raptors 88-87. Iverson wasn't even the top scorer on the team, scoring only 21 next to Aaron McKie's 22. "We're a team," Iverson said. "For the first time in my life I'm on a team." In the dying seconds of the game, Vince had a final chance to get the win, but missed the jumper. Iverson ran to hug his mother and daughter, confetti fell from the ceiling of the First Union Center and the rest of the Sixers celebrated the franchise's first trip to the Eastern Conference finals since 1985. May 18 - Thanks to all you visitors for supporting my site! We've reached 1000 hits today. Updates are always coming. Keep checking back. Don't forget to tell your friends! May 15 - You all knew it was coming. Allen Iverson proved to the world that even the smallest player can have biggest heart as he was announced NBA 2000-2001 MVP today. He earned 93 out of 124 votes beating 2nd place Tim Duncan and 3rd place Shaquille O'neal. Iverson became the shortest (6'0") and the lightest (165 lbs) to win the Maurice Podoloff Trophy. May 13 - After two back-to-back indvidual 50 point games, everything seemed to tone down as no one came near to 50. Larry Brown started McKie, which proved to be worthwhile as he knocked down 18. The Sixers seemed back to their hustle, as they led the entire game. Raptors would pull it even in the fourth quarter, but Iverson hit a dagger 3-point that sealed the deal. Iverson scored 30 as the Sixers beat the Raptors 84-79. Sixers would lose Lynch, one of their top defensive players to a foot injury from 4 to 6 weeks. "Nobody ever told me that winning a championship was easy, and I found out the hard way that isn't easy to win a playoff game," said Iverson. May 9 - 54 was the number of points Iverson. That's a career playoff-high. Sixers beat the Raptors 97-92 with a phenomenal performance by AI. "I always feel the only person who can stop me is myself," Iverson said. "The only thing I care about is getting a win. If I shoot terrible, and we win, that's all that matters." At one point he scored 19 straight points in the 4th quarter. The entire game was like another AI highlight reel. Expect a repeat this Friday up north. May 6 - Iverson had a terrible shooting game with 11 out of 24 shooting. The team committed way too many turnovers that led to a climbing Raptors lead. Vinsanity took over the entire game, making crucial back-to-back buckets late in the fourth quarter. Iverson sparked a last minute comeback by hitting a bit 3 in the dying seconds, but it was too late. Maybe they were a little to anxious coming off the short break. Iverson needs to play better mentally. Watch for that next game Wednesday. May 2 - After two years of losing to Indiana in the playoffs, Iverson and the Sixers get revenge as they beat Indiana 88-85. Despite having a poor shooting night, Iverson was well supported by his teamates who made big plays at crucial times. "I'm exhausted physically and mentally, because they brought out a lot in Allen Iverson," Iverson said. "It's been rough on me mentally. We could never get past these guys (in the playoffs)." Iverson's next challenge is uncertain, with the NY and Toronto series tied at 2-2. In the post game conference, Iverson was accompained by his son, Deuce, who has been travelling with the Sixers on the road. Playoffs 2001, Round 1, Game 4 Photo Gallery. Apr 21 - Opening game of the 2001 Playoffs. Iverson was shut down as he was double teamed every time he got the ball. Luckily his teamates picked up the paces and had a double digit lead at the end of the half. Pacers came thundering back in the second half to take the lead. In the final seconds of the fourth quarter, Philly was up by 2, but Reggie Miller answered by bombing a three with 2.9 seconds remaining. Iverson had the last shot be fell to Miller's defense. Disappointing loss at 79-78. Apr 10 - Sixers cruised past the Boston Celtics on Monday but lost a close one today to Miami Heat 103-101. Tim Hardaway hit a game winner similar to the earlier Orlando game. Iverson scored 41. At this point, I feel the Sixers do not need to play to their full potential for risk of injury. They have clinced the Conference Title and look good with their starters back in the line up. They will probably start the playoffs against the Pacers. Mar 31 - Six players have reached 50-points this season. Allen Iverson and Antawn Jamison are the only two players who are on The 50-Point Club twice. Mar 31 - During half-time, Charles Barkley's jersey was retired. Barkley, one of the toughest power forwards in his time could hardly hold his tears in as his #34 Sixers jersey went up. Sixers win their 50th game, as Iverson scored 35 points and grabbed a career-high 11 rebounds to lead the Philadelphia 76ers to a 102-89 win over the Golden State Warriors. Iverson was one assist shy of a triple-double, he said after the game, "I really wanted it because I never did it before. To have a triple double, that's a great all-around game. And on a night like this when you have one of the greatest players to ever play the game, the whole all-around game, and he gets his jersey retired, it was something I wanted to look back on. It was a great night, my mom got to see Charles get his jersey retired, I got a chance to see it. It was something special, something I'll cherish for the rest of my life." Mar 28 - This must have been one of the more exciting games of the year. In the final seconds of the the fourth quarter, Magic led by 2. Iverson, with 7.6 seconds left, hit a jumper and got the foul, putting Philly up by 1. In the final seconds, T-Mac thundered down the lane and hit the buzzer beater. No 50th win for Philly tonight, tune in next game. Allen Iverson : Old News: Allen Iverson signs a lifetime contract with Reebok. 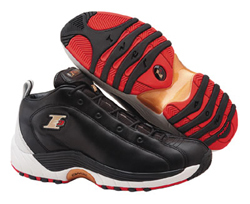 Iverson signed a lifetime endorsement contract with Reebok on November 28, 2001. The deal is an extension to his 10 year, $50 million deal signed after being the No. 1 pick in the 1996 NBA draft. Terms of the deal weren't disclosed, but Fireman, CEO of Reebok, said he'd never before signed a "lifetime" deal for Reebok. "It shows a lot of commitment, and hopefully I can stand up to my part," Iverson said. "I didn't have the greatest past in the world, but they always stood by me and always stood up for me when times were bad. This is another time they stood by me and I'm just looking forward to doing the best I can for Reebok." Reebok gave Allen a Breitling watch during a news conference announcing his lifetime contract . Mar 26 - Welcome to the first version of The Answer Online. This site is dedicated to the soon-to-be NBA MVP superstar Allen Iverson. Iverson, in his 4th NBA season, is leading the NBA in scoring and in steals. The Philly Sixers are the number one team in the NBA and have clinched the playoff spot already. Tune in as Allen and the Sixers climb their way to the NBA championship. Be sure to check back often for news and updates as the we approach the playoffs.